Treat your patrons to freshly made crepes topped with your signature sauces and fillings by adding this Carnival King GCM16LP 16" liquid propane crepe maker to your lineup! Boasting 22,000 BTU of cooking power, this unit makes whipping up a batch of fresh crepes at your busy restaurant or hotel breakfast bar a breeze. Designed with simplicity in mind, this crepe maker features a battery operated ignitor button for easy operation, while its manual temperature control knob allows you to set the perfect temperature for your needs, taking the guesswork out of the cooking process. This unit's heavy-duty stainless steel construction makes it easy to clean and maintain, as well as tough and durable enough for frequent use in your cafe. 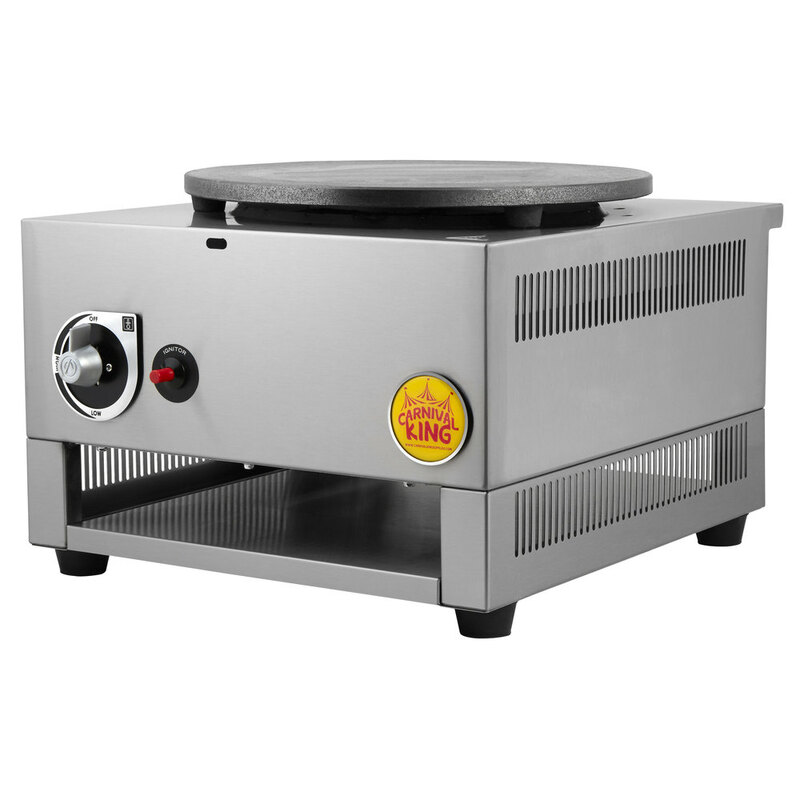 Made of heavy-duty cast iron, this unit's 16" diameter plate provides ample room to evenly spread your batter into a thin, delicate layer while also offering excellent heat retention for maximum efficiency and superior results. The plate also features a non-stick coating to prevent the batter from sticking, ensuring your crepes are always smooth and perfectly cooked to a light golden brown. Thanks to its compact size, this unit is ideal for small prep areas or food trucks where space is limited. Plus, its non-slip feet help add stability to the unit to ensure that it doesn't slide or scratch your countertop while you're cooking. This unit ships ready to use as liquid propane and includes a natural gas conversion kit.